DIABETES: Have You Been Tested? The Rogue Women Writers want to welcome Wendy Corsi Staub, the New York Times and USA Today bestselling suspense author who has written more than 80 novels and twice been nominated for the Mary Higgins Clark Award. I first met her years ago at the Colorado Gold Conference in Denver. She was an editor then, and I was unpublished. I thought she was cool then. Now we're both published by Crooked Lane Books, and I get to hang out with her at publisher parties. Pinch me! 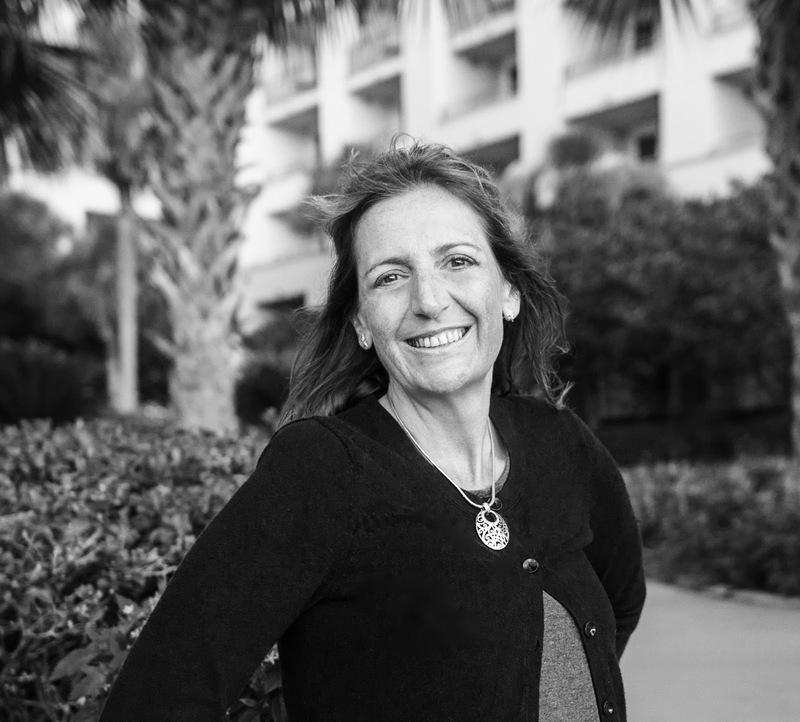 Smart, funny, energetic and generous, Wendy is a great storyteller. Thanks for taking the time to bask In The Rogue Limelight. Growing up, I steered clear of Narnia. As an English major, I loathed Animal Farm. Working part time at a bookstore, I gave Watership Down a wide berth. So, yeah, NO. I’ve never been a fan of books about animals with human characteristics, other than Charlotte’s Web--ironic, since I’m terrified of eight-legged creatures. I do, however, have great affection for four legged ones. Particularly cats. I just don’t want them talking and solving crimes in the books that I read and write. Or, necessarily, in real life. 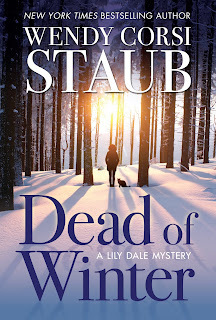 So I was taken aback when a longtime reader mentioned that she’d read everything I’ve ever written except my recent Lily Dale mystery series because “It’s about paranormal cat detectives…wait, isn’t it?” she added, seeing my dismay. It is not. But I can see why she may have gotten that impression, and I figured I’d better set the record straight now, as the third book in the series, DEAD OF WINTER, goes on sale (Crooked Lane, November 7). The series is set in quirky Lily Dale, New York, a very real Victorian lakeside cottage colony located a few miles from my hometown. Back in the 1800s, the Dale was the birthplace of the American Spiritualist movement, and remains populated by psychic mediums, people who can talk to the dead. Or can they? My heroine, Bella Jordan, a pragmatic former science teacher, doesn’t think so. As the new proprietor of the Dale’s Valley View Guesthouse, she can usually find a logical explanation for frequent strange goings on around the village. Usually. Unlike her neighbors, she doesn’t rely on a sixth sense or communication with murder victims themselves to solve the mysteries surrounding their deaths. She uses good old-fashioned detective work. The series opener, NINE LIVES (November, 2015), was inspired by an enormously pregnant stray tabby who showed up on our family’s doorstep a few years ago and refused to leave. My husband is deathly allergic to cats, but this one was deathly ill. Long and dramatic story short, she delivered six kittens, and we rushed her and the babies an emergency vet who saved them all. We eventually found homes for the sweet little litter. My husband was as enamored with the beautiful, enigmatic mama as our teenaged sons and I were. 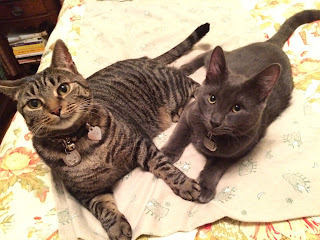 We named her Chance the Cat, and she lives with us, and as I write this blog, my husband is at the allergist getting his weekly shot. I hadn’t intended to write a traditional mystery series, as I have a thriving career writing psychological suspense novels for HarperCollins, and no longer even have time to write women’s fiction under my pseudonym Wendy Markham. But on the very day Chance first showed up on our doorstep, my agent and I had had lunch with well-respected editor Matt Martz, who wanted me to write for his new publishing house, Crooked Lane. It was a flattering invitation, but I had a multi-book Harper contract with tight deadlines, so I left feeling like the girl who has a longtime boyfriend and has just been asked out by the cute new guy at school. When I got home from that lunch…there she was. Chance the Cat. In Lily Dale, the mediums believe there are no coincidences. And the community is very fond of its pets, particularly cats, considered mystical creatures who always cross our paths for a reason. I had an epiphany the morning after Chance and her babies had survived almost certain death, while I was wondering how we were going to pay a ginormous (thou$ands!) veterinary bill for a stray. I was supposed to write about her! For Matt, and Crooked Lane! The premise for my Lily Dale series opens with Bella, having just lost her husband, her job, and the roof over their heads, moving with her little boy, Max, halfway across the country to live with her only relative—her mother-in-law, Millicent, whom Bella has always privately called Maleficent. But mid-trip, a pregnant stray tabby named--what else?--Chance the Cat literally plops herself in their path, so they detour to return her to an innkeeper who lives in—you guessed it—Lily Dale. She also happens to have just turned up floating facedown in the lake. An ailing Chance has eight kittens, Bella and Max stick around to care for them, run the guesthouse, and solve the owner’s murder. Allergy shots are helping, but my husband can barely breathe at this point, so we can no longer foster. But a few months after Chappy arrived, a little black cat showed up on our doorstep, loudly complaining about the chill in the air, the field mouse that got away, the alpha tabby glaring at him from our back window. I fed him, because I’m a pushover for a sparkling feline conversationalist with striking kiwi eyes. He stuck around, and I started calling him Sanchez—after dashing dark-haired Aaron Sanchez, my favorite chef on my favorite Food Network show, Chopped. No, we haven’t taken him in. We’re not crazy cat people. No, really, we’re not. But we may have set him up in a heated little house on our deck, where he’s safe and snug and looks forward to three (or more) meals a day, lots of affection from our family, and flirting with the lovely Chance, an indoor-only gal who’s made it clear she has no interest in the Latin Lover on the deck. And yes, like Chance and Chappy Sanchez has made his way into my Lily Dale series. In DEAD OF WINTER, an outspoken black kitty with kiwi eyes crosses paths with an asthmatic killer Elvis imitator (yes, you read that right) roaming the Dale in search of a missing priceless treasure. Meanwhile, Christmas is coming and an impoverished Bella is wondering how Santa is ever going to visit Valley View for Max, whose best friend, Jiffy Arden, the precocious psychic kid next door, has gone missing in a December blizzard—just as he’d predicted months ago. I hope you’ll join me, Bella, and a colorful collection of quirky characters for this light-hearted mystery full of twists and turns and yes, cameos by cats who would say thank you, thank you very much—if they could say something other than Meow. Guess you’ll have to go to Narnia for that…but I’ll see you in Lily Dale! Welcome Wendy - I truly enjoyed your great post! And your new novel sounds like the perfect Christmas gift -- especially for our friends who love cats as much as you obviously do (so glad you have rescued so many of these cute little pets). Thanks for writing for us! This is a wonderful tale of how families happen. And I’m a dog person. Ordering the first Lily Dale today. Wonderful tail. Have two cats myself - one of whom I found at two weeks mewing in our window well where mama cat had left her. I of course brought her in and bottle fed her, while my husband stormed about not needing another cat. Fourteen years later, my husband is the one she adores, and he loves her right back. (She bites me.) Thanks for writing for us. Looking forward to reading the Lily Dale series. My girls and I found a Russian Blue kitten--toddler really--living in a culvert near the Doctor's office in Idaho Springs. We brought him home, named him Smoke and the girls loved him for about three days. By then we discovered that two of the girls were so allergic to the cat that he had to move to the garage. He wasn't happy, and the girls weren't happy. The dogs on the other hand rejoiced. Two days later we gave Smoke to my aunt Dorothy, who promptly named him Herbie and integrated him into her family of three indoor cats, two outdoor cats and Rudy, the fox that likes to sleep on the bench at her back door. Hi Wendy! Glad to see you here. Looking forward to DEAD OF WINTER. I remember you telling me about Lily Dale and it's spiritualist founders. We'll have to take a road trip and you can show me around!